The U.S. Department of Energy has awarded the 2011 E. O. Lawrence Award in Biological and Environmental Sciences to Tom Guilderson, an associate researcher in the Institute of Marine Sciences and lecturer in ocean sciences at UC Santa Cruz. The award honors Guilderson "for ground-breaking radiocarbon measurements of corals, advancements in understanding the paleo-history of ocean currents and ocean processes revealing past climate variability, and the elucidation of how physical and biogeochemical oceanic processes affect the global carbon cycle." 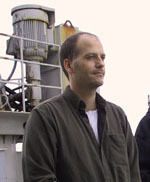 Guilderson is based at the Lawrence Livermore National Laboratory, where he is a senior research scientist in the natural carbon research group. He has been affiliated with UC Santa Cruz for the past decade and collaborates with other UCSC researchers on various projects. U.S. Secretary of Energy Steven Chu announced the winners of the 2011 Ernest Orlando Lawrence Award on Monday, November 28. Nine winners were named in eight categories for their outstanding contributions in research and development supporting the DOE and its missions. Winners in each category will receive a gold medal, a citation, and $20,000. They will be honored at a ceremony in Washington, D.C., early next year. The Lawrence Award was established in 1959 to honor the memory of Ernest Orlando Lawrence who invented the cyclotron (a particle accelerator) and after whom two major DOE laboratories, in Berkeley and Livermore, are named.